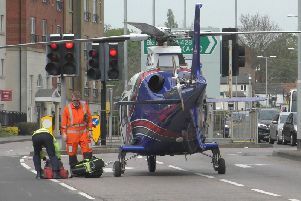 An accident involving two cars forced the closure of a road outside a Northampton shopping centre. Emergency services were called to Billing Brook Road outside Weston Favell Shopping Centre at around 9.50am this morning (Wednesday) where there had been an accident involving two vehicles. Police, fire and ambulance crews were all on the scene, with officers closing the road due to a vehicle blocking it. A spokesman for Northamptonshire police said it is believed there are no serious injures and that officers are dealing with the incident.